Artist's interpretation of the Next Giant Leap team's hopping lunar lander. A privately funded team trying to win a multimillion-dollar race to the moon has scored a big grant to help develop its hopping lunar landers. Next Giant Leap, which aims to take home the Google Lunar X Prize, has received a $1 million grant from the not-for-profit Charles Stark Draper Laboratory, the team has announced. Next Giant Leap will use the money to continue developing and testing its innovative moon landers, which will be able to hop about on the lunar surface, officials said. "Draper is investing in our hopper technology to land on the moon," Next Giant Leap marketing director Chris Pavlovski told SPACE.com. "We're going to be doing something completely new, something that hasn't been attempted before." 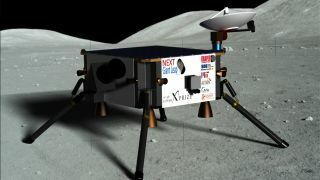 The Google Lunar X prize is an international moon exploration challenge to land a robot on the lunar surface, have it travel at least 1,650 feet (500 meters) and send data and images back to Earth. The first privately funded team to do this will receive the $20 million grand prize. An additional $10 million is set aside for second place and various special accomplishments, such as detecting water, bringing the prize's total purse to $30 million. The Google Lunar X Prize expires whenever all prizes are claimed (or, failing that, at the end of 2015). Twenty teams are currently in the race. Next Giant Leap, which is based in Boulder, Colo., hopes to take home the top prize. The team counts Draper, the Massachusetts Institute of Technology, the aerospace firm Sierra Nevada Corp. and other groups among its partners. Rather than going with a standard wheeled rover, Next Giant Leap decided to build an exploration craft that can make short powered flights around the moon. This approach offers big advantages, according to team officials. "This ability to hop from place to place is super for exploration," Next Giant Leap founder Michael Joyce told SPACE.com. "We can avoid rocks, cliffs, craters — go places that a regular wheeled rover can't go." The hopper is pretty far along, Joyce added. The new grant from Draper should help Next Giant Leap further develop the craft's guidance, navigation and control systems, as well as set up and run an Earth-bound hopper testbed. When the new hopper software has been finalized and tested, it will be incorporated into the actual spacecraft hardware, which is being built by the Sierra Nevada Corp.
"We're mashing up the two technologies," Pavlovski said. Joyce and Pavlovski declined to say when the team hopes to launch their mission and land on the moon. But they expressed confidence that Next Giant Leap is the team to beat. "I don't see anybody even close to us right now, in terms of where we are," Pavlovski said. Next Giant Leap has its eyes on the $20 million, but the team's ambitions don't stop with the Google Lunar X Prize. "We see it as a proof of concept for missions we hope to provide in the future," Joyce said. Those missions could be government research jaunts to the moon, asteroids or the moons of Mars, Joyce added. Or they could be commercial operations, such as efforts to prospect for water ice in permanently shadowed craters at the lunar poles. Next Giant Leap's hopper technology could aid such missions, helping them cover a great deal of ground at a low cost, according to Joyce. "I think that once we've proven ourselves, then these customers will actually commit," Joyce said. "We think there are going to be a lot of people interested in grabbing the wealth that's out there. There's going to be some money to be made providing services to these people."